What Does Bhakti Have to Do with Vedanta? NOTHING, says a letter to the Bhaktivedanta Institute. EVERYTHING, Ravi Gomatam replies. Puzzling Inconsistencies. The brochure you sent me states,“Our in-house research uses paradigms for consciousness from the Bhagavata tradition of Vedanta.” This statement is a source of confusion for me. It is well known that the Vedas are divided into two sections, the first being the karma-kanda section and the last the jnana-kanda section. The jnana- kanda section is also called Vedanta (or “end of the Veda”). The word “bhagavata” means “one who is devoted to Bhagavata (the Lord).” The material relating to the “Bhagavata tradition” and “bhakti” (devotion) is covered in the karma- kanda section of the Vedas and is not the subject of Vedanta. Bhakti assumes a dualistic relationship between the devotee and the Lord whereas Vedanta is “advaita,” or nondualistic. Therefore, I am confused by the name of your institute, “Bhaktivedanta,” since according to my understanding the words “bhakti” and “Vedanta” refer to separate teachings, with fundamental differences, that employ different methodologies. My confusion is further augmented by the fact that there was a well-known swami, Swami Prabhupada (who also went by the name A.C. Bhaktivedanta), who founded the Hare Krishna movement. As you no doubt know, the Hare Krishna society is a modern religious movement totally unrelated to traditional Vedanta. When one studies traditional Vedanta, one learns that there is a clear distinction made between absolute reality (paramarthika) and empirical reality (vyavaharika). In this context, science is the study of empirical reality. Traditional Vedanta teaches that the fundamental nature of everything (absolute reality) is consciousness (or awareness). Further, empirical reality is dependent on consciousness (absolute reality). So if one subscribes to the teachings of traditional Vedanta it logically follows that science (the study of dependent reality) is subsumed by consciousness. Another way of saying this is that “science” is the “object” of the “subject” which is consciousness. I am impressed that you have a highly competent staff, and I am puzzled by the philosophical inconsistencies that appear in the material you sent me. I would very much appreciate your response to this letter. THE WORD Bhaktivedanta is not at all incongruous, popular understanding of bhakti and Vedanta notwithstanding. There are two traditions of Vedanta—the impersonalist and the Vaishnava. Both have existed since time immemorial. 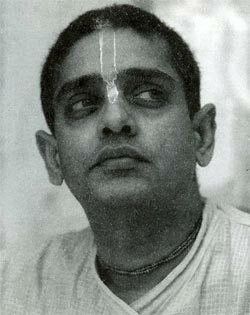 Sripada Adi Sankaracarya is the best-known modern acarya (teacher) of the impersonalist school, and Sripada Ramanujacarya, Sripada Madhvacarya, and Sri Caitanya Mahaprabhu are the best known modern acaryas of the Vaishnava school. When the impersonalists speak of Vedanta, they generally refer to the Sariraka-Bhashya of Sripada Adi Sankaracarya. But this is not the only bhashya (commentary) on Vedanta-sutra. There are outstanding commentaries by Vaishnava acaryas, such as the Sri Bhashya of Ramanujacarya, Govinda Bhashya of Baladeva Vidyabhushana, and Tatparya Nirnayas of Madhvacarya. The presence of the Vaishnava commentaries refutes the popular notion that only one tradition studies Vedanta, while the other, called bhakti, has nothing to do with it. Bhakti, supposedly, is for the less intelligent (“people of the heart” is the usual cliche) while impersonalist jnana is for the highly intellectual (and, by implication, more advanced). But the truth is that every bona fide Vedic tradition is directly based on Vedanta. The two schools, therefore, are not jnana and bhakti, as you mention, but Mayavada (impersonalist) and Vaishnava (personalist). It is therefore untrue that those who perform bhakti are devoid of knowledge. Rather, knowledge at its highest level culminates in devotion. This is confirmed in Bhagavad-gita, which gives the essence of the Upanishads, which in turn form the basis of jnana- kanda. Bahunam janmanam ante jnanavan mam prapadyate: After many births and deaths, the real jnani surrenders to Vasudeva, Lord Sri Krishna (Bg. 7.19). In the twelfth chapter of Bhagavad-gita, Arjuna asks which path is better, the impersonal or the personal. Lord Krishna answers unambiguously that the personal path is better. The personalist and impersonalist schools both follow practices of bhakti and of jnana. Indeed, jnana and bhakti are eternal characteristics of the conscious spirit soul. In the material world they are directed to the wrong objects, but in the spiritual world they are present in their pure form. When we speak of Bhaktivedanta, therefore, we refer to the Vaishnava (personalist) Vedanta tradition. We use the term deliberately, since Vedanta alone has come by usage to refer to the impersonalist school. The first Bhaktivedanta commentary on Vedanta- sutra was Srimad-Bhagavatam, written by the compiler of Vedanta-sutra himself, Srila Vyasadeva. Later Vaishnava acaryas further elaborated on the meaning of Vedanta by following in Srila Vyasadeva’s footsteps. Now, some of your objections are not just a matter of philosophical difference but are factually incorrect. For example, you say, “Bhakti is covered in the karma-kanda section of the Vedas and is not the subject of Vedanta.” Nowhere in the scriptures is this substantiated. The karma-kanda section of the Vedas concerns fruitive activities—that is, religious rituals performed for material rewards. These are technically called trai-gunya-vishaya veda, or affairs of the three modes of material nature. But bhakti is transcendental to the three modes and to fruitive mentalities. The beginning and fundamental tenet of bhakti is to serve the Supreme Lord without expectation of material rewards. How then can bhakti be a sub-ject of the karma-kanda section? What you might be confusing it with is the worship of the demigods—Lord Brahma, Lord Siva, Indra, Mother Parvati, Candra, etc.—which is indeed part of the karma- kanda section. Such worship, however, is not properly called bhakti. It is simply worship within the three modes to obtain material benedictions. Worshipers of demigods are described in the Bhagavad-gita as less intelligent (alpa-medhasam), and the fruits they receive are limited and temporary. Bhakti is often thought to be a mere sentiment cultivated in relation to any object of worship (ishta- devata). According to this idea, it is only a means to come to the higher platform of jnana. Yet the scriptures do not support this definition of bhakti. Bhakti properly refers only to service to God, not to any demigods. Therefore, bhakti is not an affair of the karma-kanda section. You say,“Bhakti assumes a dualistic relationship, whereas Vedanta means advaita, or nondualistic.” This, however, is not stated anywhere in the Vedic scriptures. Vedanta is simply the study of the Supreme Brahman. That Supreme can be studied by either the monists or the Vaishnavas. Otherwise, how is it that great Vaishnava acaryas have written commentaries on the Vedanta-sutra? You also assert that bhakti is not the subject of Vedanta. But in Bhagavad-gita the Supreme Lord Himself declares, vedaish ca sarvair aham eva vedyah: “By all the Vedas [and this naturally includes Vedanta], I am to be known.” The same truth is indicated in the beginning of the Vedanta-sutra: athato brahma jijnasa. The very purpose of Vedanta is to inquire into the Supreme Braman. And inquiring into the Supreme Brahman ultimately leads to bhakti, or serving the Supreme Brahman, the Personality of Godhead. The Hare Krishna movement, you say, is a “modern movement totally unrelated to traditional Vedanta.” Here you are wrong on two counts. First, the Hare Krishna movement is not a modern movement, but is in the Vaishnava tradition. It may be new, and hence modern, to Westerners, but not to us Indians. I was born a Vaishnava, and I know that this is the ancient tradition and culture of India. Not only that, but the modern form of the Hare Krishna movement as it is known in the West was inaugurated by Sri Caitanya five hundred years ago in Bengal. So it can hardly be called modern in the sense of having a recent origin (though it may be called modern for being relevant to contemporary life). Second, and more serious, you say that the Hare Krishna movement is not at all connected to traditional Vedanta. I take it that you mean monistic Vedanta. The Hare Krishna movement has nothing to do with monistic Vedanta but everything to do with traditional Vaishnava Vedanta. The term Bhaktivedanta in our institute’s name refers to the Bhagavata, or Vaishnava, tradition of Vedanta. The Bhaktivedanta Institute is an autonomous institute dedicated to examining the relevance of the Bhagavata concepts of consciousness to modern science. His Divine Grace A.C. Bhaktivedanta Swami Prabhupada, the founder of the Hare Krishna movement, inspired the formation of the Bhaktivedanta Institute. The word Bhaktivedanta in his name is a title awarded him in the 1930’s for presenting the Vaishnava tradition of Vedanta authoritatively and clearly. The institute, though autonomous, draws from the same spiritual tradition as the Krishna consciousness movement, which was also founded by Srila Prabhupada. The institute’s programs, however, are specifically in the realm of science and consciousness. As for your final point concerning the nature of empiric reality and absolute reality—this touches the core of our scientific work. I would like to talk with you more about it once we clear this stage of our discussion.